This is the summary of consumer reviews for Manhattan Toy Winkel. The BoolPool rating for this product is Very Good, with 4.40 stars, and the price range is $10-$15. 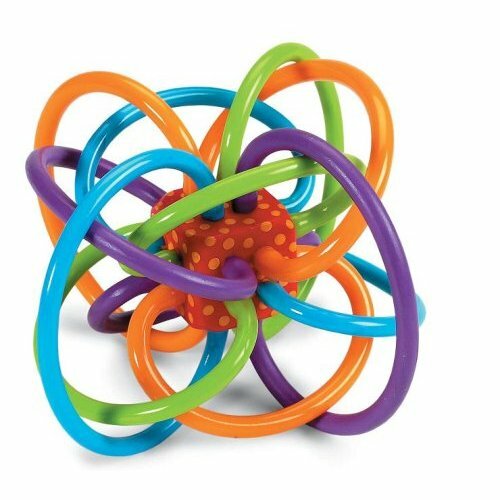 Manhattan Toy Winkel is a mesmerizing maze of safe, soft, continuous tubes and is perfect for a teething baby to chew on. 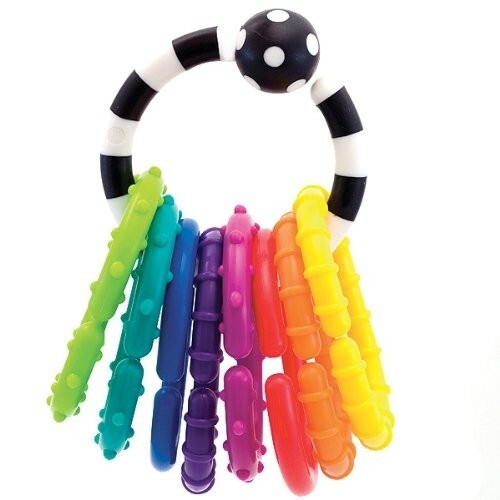 Its bright and bold colorful loops made from soft, pliable plastic are easy to grasp, hold and pass from hand to hand. 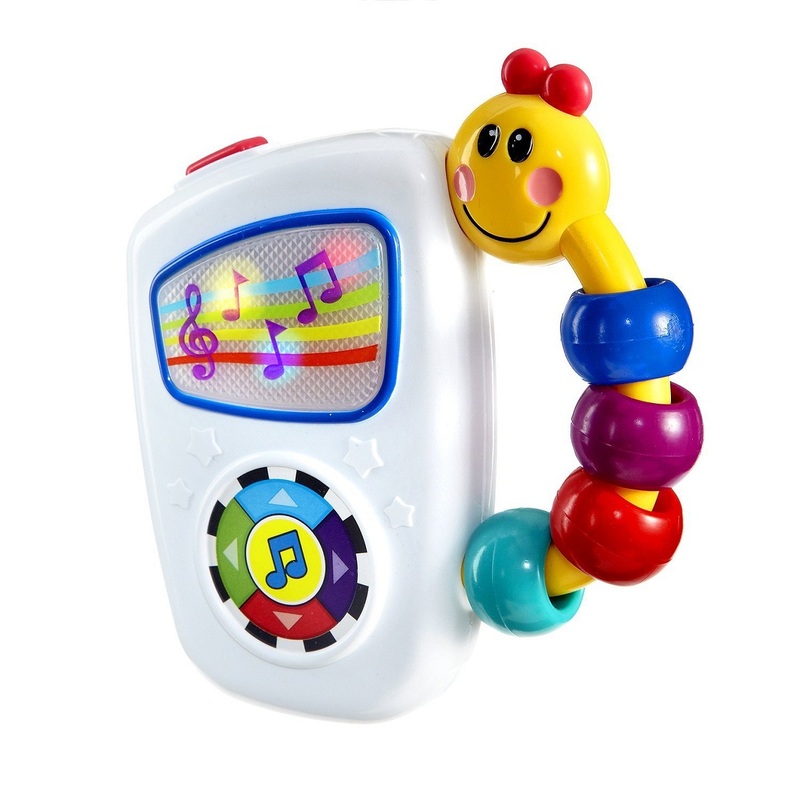 This toy keeps babies engaged and amused with a responsive rattle in the middle. 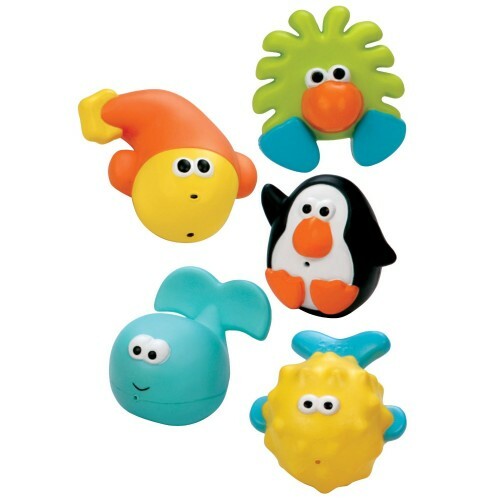 Caregivers can safely refrigerate this pliable plastic toy to produce a soothing teether. It is lightweight, soft and does not hurt the babies. Some parents mention that this toy does not hold kid's attention for long time and infants outgrow this toy very fast. A few buyers also complained that the rattle in the middle bleeds color, when washed with soap. 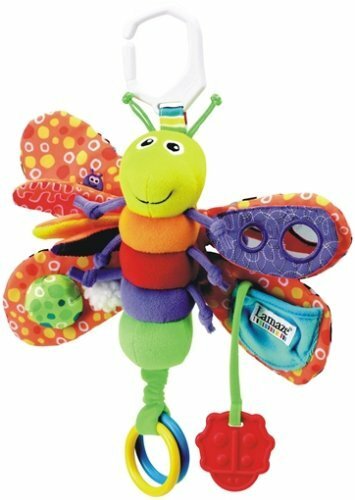 Overall, Manhattan Toy Winkel is a simple and inexpensive perennial favorite which helps develop hands coordination and stimulates vision development among infants. The Winkel is made of PU tubing (polyurethane) and as such does not contain BPA or PVC. This was the first toy that my son really showed an interest in, starting at around 3 months. I thought this'd be an interesting toy for my 4 month old to play with over the next few months. At 9 months old, they've zero interest in it. He began to lose interest in it around 6 - 7 months. I bought it for her when she was about 3 months old and really starting to like rattles. We bought this early on when our son could begin grasping, probably around 2 or 3 months. UPDATE: Three years later, and I now have a second daughter who's three months old, and the Winkel is the first toy that she really will play with, so maybe my first really was the exception. Every time we give it to her (starting at around 4 months and now at seven months), she picks it up and immediately discards it. I bought this toy for my 4 month old granddaughter.She loves it and it goes everywhere with her. Because the tubing is easy to grab a hold of, my seven week old baby can easily grab on and shake it around. He's 3 months old and finds this toy really easy to grab. Light weight and easy for him to practice grabbing and holding skills. My 3 month old son just grabbed this and started chewing on it. My 4 and 1/2 month old son loves the winkel. The multiple loops are easy to grab for my 8 month old to manipulate the toy. It's small enough for grabbing the loops, very colorful, has a rattle. He loves to grab the toy and shake it, as the center has a tiny rattle sound that's very amusing for babies. Several places for him to easily grab, super light weight, he loves to chew on it, and it's soft, so it doesn't hurt when he hits himself in the head or face. This's the perfect little toy for little hands. Little square rattle in the middle keeps attention. Perfect for little hands to grip around. I don't think a little baby could *not* grab this toy - where ever their little fingers go, there's a perfectly-sized tube to grab. Very colorful and has a little rattle in the middle. 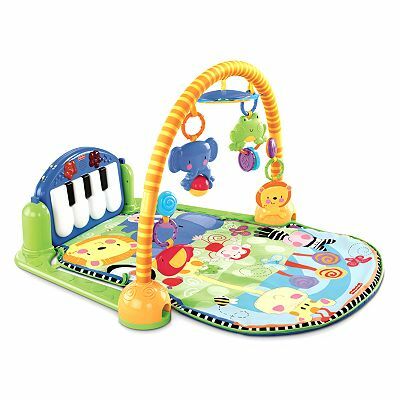 It also has a little rattle feature in the center block of the rings and provides just enough of a soft rattle for those little ones who like to shake it up!. A little disappointed about the quality since the little things inside the cube that make the rattling sound often get stuck. Their little hands will be able to grasp every angle, and its also a teether. Great collors and a nice little noise. Easy for my 3 1/2 month old to grasp and hold onto. Easy to hold onto and bite! Also, while it's easy for little hands to graps, my baby holds it for about 5 seconds before losing interest. My baby liked holding and turning it in his hands, but would quickly loose interest. The rings are also small enough for an infant to grasp and hold onto. This winket is worth the money -- she loved this as young as 2 months because its pretty light and easy to hold. Although it doesn't seem to hold her attention for long yet?. My 3 month old daughter absolutely loves this toy. This toy is OK. My 5 1/2 month old is able to hold onto it easily, but just doesn't seem to like it as much as her other toys. The colored rings are perfect for his little hands and he can chew on it while he holds it. light and easy to hold for babies. Baby can put it in his mouth without swallowing, lots of colors, bright. The loops are easy for tiny babies to grasp. This's our 4 months old baby's second favorite toy. It's brightly colored so it's appealing to baby. The toy is light enough to be held by baby without difficulty and the pipes are soft enough so that if baby bangs the toy on her head, she wont get hurt. They're also colorful so they stimulate a baby's developing vision. As he got older, it was easy for him to pass from hand to hand. 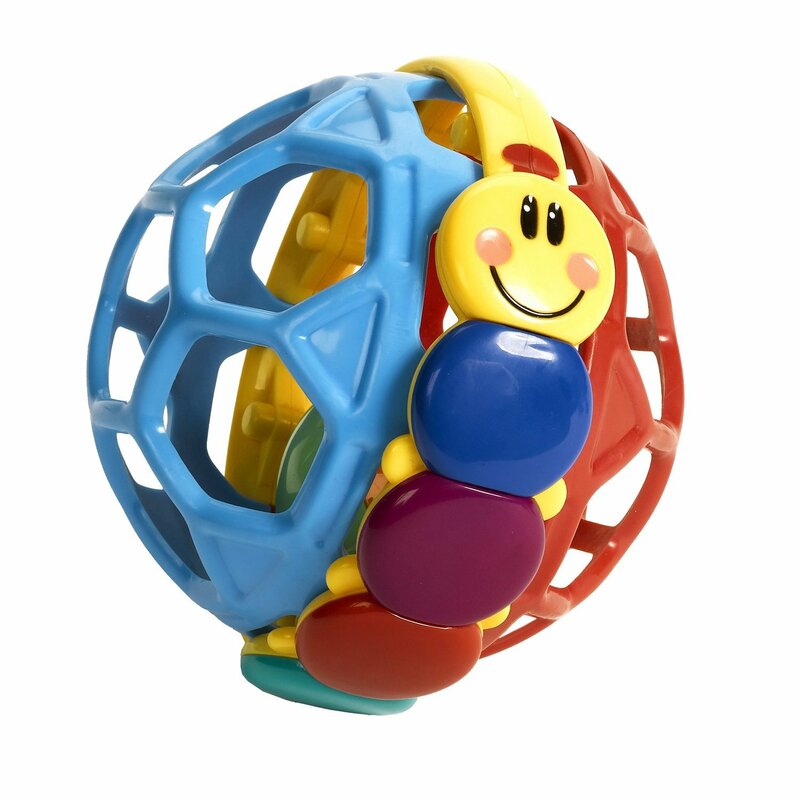 The many loops help develop hand coordination and using both hands to bring the toy to midline. I bought it because several of my friends' babies used this toy from 3-18 months. My 4-month old sons loves this toy! I bought this for my son when he was about 4 months old and he plays with it all the time. My husband and I bought this toy at Babies R Us for our son when he was about 6 or 8 months old. He's been playing with it for over a month. Fun, engaging and helpful for developing two-handed play. I could see that perhaps an older child mightn't find this engaging enough, but our son still enjoys playing with it and chewing on it now as a 7 month old. It's so light that it's easy for her to pass from hand to hand, and to pick up when she drops it.